The Hunter Valley beer scene is really hoppin' with a tasty collection of award-winning breweries. ​Crowned Champion Small Brewery at the Craft Beer Awards in 2016, this brewhouse in the Hope Estate wine and concert complex also took home gold, silver and bronze medals at this year's Australian International Beer Awards and Independent Beer Awards Australia. There are a dozen beers on tap this month, ranging from refreshing lagers, American style IPAs, Pale Ales and Red Ales to barrel-aged extra stout and cider. "Hope Pale Ale is our biggest seller," says head brewer Matt Hogan. "But that's no surprise as Pale Ale is the most popular 'craft beer' style in Australia. The Hope Pale Ale ticks all the boxes of the light, fruity modern-style pale ale that Australians have become accustomed to drinking through exposure to beers such as Stone & Wood Pacific Ale, Mountain Goat Steam Ale and James Squires 150 Lashes." But what about when the weather turns cool? "We do see an increase in the amount of darker beers that we sell during winter. Stouts, Porters, Red Ales etc. I think that the moreish malt profile and fuller body of these beers is more appealing in the cooler months." ​Looking for a sunny spot to sink a beer? This small-batch brewery shares space with Peter Drayton Wines and there's a huge beer garden overlooking the vines, where you can savour a coldie while enjoying a snack. "I really enjoy Sticky BBQ Pork Ribs paired with the India Pale Ale," says brewer Andrew Drayton when asked about his favourite winter beer and food match. "The bitterness of the IPA cuts through the sweetness of the marinade on the ribs." The brewery offers several core beers all-year-round but also play around with seasonal "funky" beers. "This month we have Summer 38, Pilsner, American Pale Ale, India Pale Ale, Far Canal Lager, Black Forest Stout and Hazelnut Brown Ale on tap, and we'll be launching two seasonal brews mid-August - Brexit English Ale and Old Nessie Scottish Strong Ale. "We were stoked to win two bronze medals at the Independent Beer Awards Australia in June for our Black Forest Stout and Pilsner," Andrew adds. As well as beers on tap, Ironbark Hill has tasting paddles, which feature four premium craft beers for $15. ​This thirst-quencher located on the ground floor at the Crowne Plaza Hunter Valley Resort has been winning awards since it first opened in 2014 and collected a swag more at the Australian International Beer Awards and Independent Beer Awards Australia earlier this year. And yep, most of the winners are on tap this month. You can taste the gold-medal winning Darlo Dark, as well as Pittwater Bitter, Lovedale Lager, Potts Point Porter, Surry Hills Pils, Sydney Session Lager and Paddo Pale. There are a couple of alternating ales on offer as well and the sought-after Sydney Cider is also on tap every day. But what does head brewer Scott Hayward like in winter? "You can't beat braised lamb shanks with our Potts Point Porter," he says. "The rich malty flavour of the beer is a classic pairing with the velvety lamb. You can also braise the lamb in the Porter for a double-whammy of deliciousness." ​Which beer to try first? 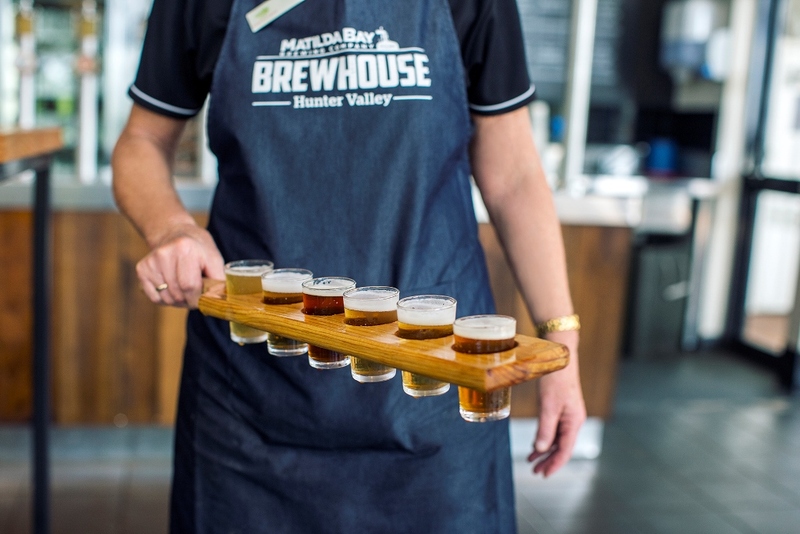 You're spoilt for choice at this brewhouse at Hunter Valley Resort with 12 delicious drams on tap, including Redback, a traditional German wheat beer; several pale ales, including an Americal Pale Ale with a zesty clean finish to an alcoholic ginger beer made onsite using a 300-year-old recipe. "During the winter months the thirsty masses tend to go for the darker ales and lagers," says food and beverage manager Phil Collis. "The Ruby Tuesday American-style amber ale with its toffee apple and creamy malt flavours goes down a treat with a smoked kangaroo dish. And the deep chocolate and nutty roasted tones of our Rich Stout and beer-braised beef cheek is hard to beat." The brewhouse also offers two types of beer-tasting paddles with six samples in each for $15 with tasting notes on each brew. "And when you take the paddle back to the bar you get a free middy of your favourite beer," Phil adds. And who doesn't enjoy a beer on the house!